Commercial kitchen fires can get out of control faster than a flash in the pan. Without the proper precautions in place, your kitchen, establishment, staff, and customers are all susceptible to the dangers of volatile kitchen infernos. That's where the Cobra System comes into play. 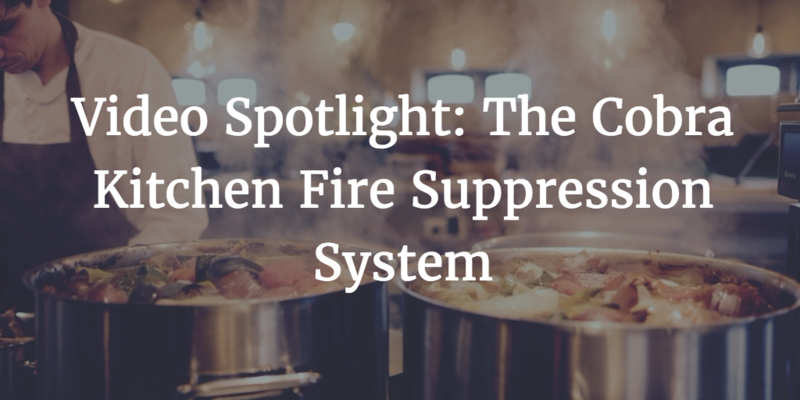 This flexible, full-proof kitchen fire suppression system is ideal for busy commercial kitchens that rather focus on the quality of their food instead of the dangers of the flame. Commercial kitchens by their nature have always been a fire challenge. Cooking with fire and extreme high temperatures pose a greater risk. Protecting your investment is about saving people’s lives, preventing loss of revenue, and protecting your property. The new Cobra system, by Amerex, is based upon years of research, combining proven protection schemes of zone defense overlap and KP Appliance Specific into one powerhouse of protection. No restaurant system has ever had this flexibility, much less integrated with an electronic control system and a maintenance free agent distribution system. Like any fire suppression system, it all starts with detection. With Cobra, you have the option of a PRM Control Device or two electric detection options, either by themselves or combined. Linear heat detection wire is run throughout the hood with easy to install connecters. Once the hazard reaches the rated temperature, the inner conductor wires contact each other, initiating an alarm signal. Your other option is thermal heat detectors, which accurately sense the surrounding air temperature and initiate system actuation. When combined, your detection system can automatically address any hazard concern within the protected area. You also have the manual pull station for backup. An exclusive feature of Cobra is the new Strike Electronic Control System (ECS), which can be tied into auxiliary controls like the building alarm system. One strike ECS can monitor two completely separate hood systems, and has a stainless steel enclosure that can be placed within 100 feet of the agent tank for maximum flexibility. Once the detection signal is sent to the Strike ECS, a series of critical actions are initiated. Audible and visual alarms are activated. The gas valve is shut off. Simultaneously, the Strike ECS sends a signal to open the nitrogen cartridge and pressurize the agent tank in the new stainless steel enclosure designed to compliment your kitchen. The new nitrogen cartridge has a pressure gauge to easily tell if your system is on the ready, and can be electrically monitored by the Strike ECS. The Cobra system uses less liquid agent and is non-corrosive to your kitchen appliances in the event of a discharge. And for seasonal kitchens, it will not freeze or crystallize in cool temperatures. When initiated, the nitrogen cartridge releases compressed gas to actuate the liquid agent tank. The liquid agent is released quickly in the attractive stainless steel agent distribution system with chrome sleeves. Easy to install with quick fitting connecters, the stainless steel agent distribution system provides less resistance to agent flow and will not corrode over time with existing hydrogen systems. The liquid agent is then distributed through nozzles to suppress the fire hazard through saponification. Cobra uses zone defense total flooding zone of protection coverage to give you flexibility in your kitchen appliance layout and with 60 inch nozzle heights, there’s no interference with your cooking operations. But kitchens do change, and new appliances can pose coverage challenges. With Cobra, you have the ability to add appliance specific, low-proximity coverage to make sure you are thoroughly protected. If added help is needed, you have the Amerex hand portable wet chemical fire extinguisher designed for kitchen fires to complement your Cobra system. Designed to give the best of both worlds, the Cobra system has set the standard for commercial kitchen fire protection. The new Cobra System by Amerex is aggressive kitchen fire protection.